Rabbit teeth grow continuously, so it is important that they grind their teeth down. In the wild, rabbits do this by eating fibrous grasses, leaves, and branches. In your house, rabbits will do this by eating baseboards and table legs... unless you give them fibrous grasses, leaves, and branches. Trouble has access to unlimited hay, plus he gets fresh greens, and a small amount of pellets twice a day. He also gets branches (twigs) often. 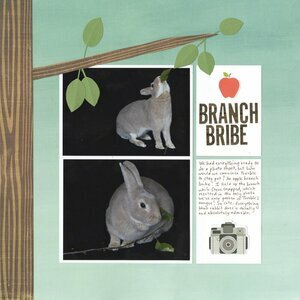 There are a number of trees that are rabbit-safe, but Trouble has a strong preference for apple branches. He devours them, particularly if there are still leaves attached. So when we wanted to do a photo shoot, an apple branch was the perfect bribe to get Trouble to pose. We had an unexpected bonus when we got a photo of his sweet little tongue! We currently don't have a source for apple branches, so Trouble has had to make do with less-desirable trees. If you're local to me and have an apple tree, let me know. I'd love to come over and get some clippings, or do a full pruning for you at the proper time of year. Just let me know. Trouble would really appreciate it! This is FABULOUS!! LOVING how you added the tree to come into the photo!!! And how sweet he loves those particular branches!!!! Trouble is SO LUCKY to have such a WONDERFUL family!